This Blueberry Almond Smoothie is smooth and creamy and so delicious!! Naturally sweetened with dates, bursting with blueberries and creamy from almonds and almond milk. It’s vegan, paleo, dairy free and whole30 compliant! Smoothies are one of the easiest ways to get your daily servings of fruits and vegetables. They are easy to whip up and it’s almost impossible to make a bad one. Yes, I’ve never met a smoothie I didn’t love. The best part, besides how delicious they are, is that it is so easy to keep them healthy. They are easy to customize to fit what ever dietary guidelines you are choosing. Like this creamy blueberry smoothie. This smoothie is vegan, paleo, dairy free and whole30 compliant! All in one smoothie and without sacrificing any flavor or creaminess. Almonds – almonds are a great source of healthy fats and fiber. Dates – use these for sweetness and keep your smoothie sweet with no refined sugar. Blueberries – antioxidant rich and delicious – read more about The Health Benefits of Blueberries. Unsweetened Almond Milk – keep this smoothie dairy free, paleo and whole30. Chia seeds – as an extra nutrient boost, top your smoothie with chia seeds. While you have them out, how about a Chocolate Chia Seed Pudding! Step 1 – put the almonds and dates in a bowl and cover with boiling water. Let soak for about 5 minutes. Step 2 – gather the rest of the ingredients: blueberries, almond milk, ice cubes, chia seeds. Drain the almonds and dates. 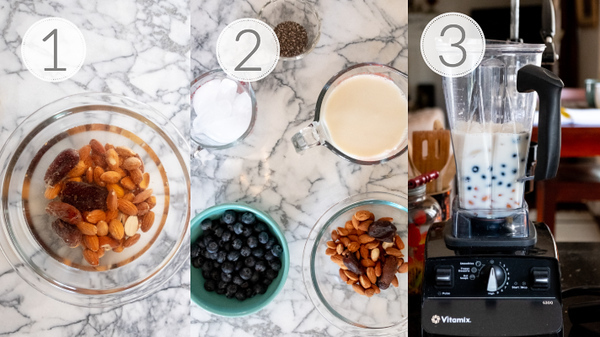 Step 3 – place the milk in your favorite blender, followed by the almonds and dates, blueberries and top with ice cubes. Process until smooth and creamy. 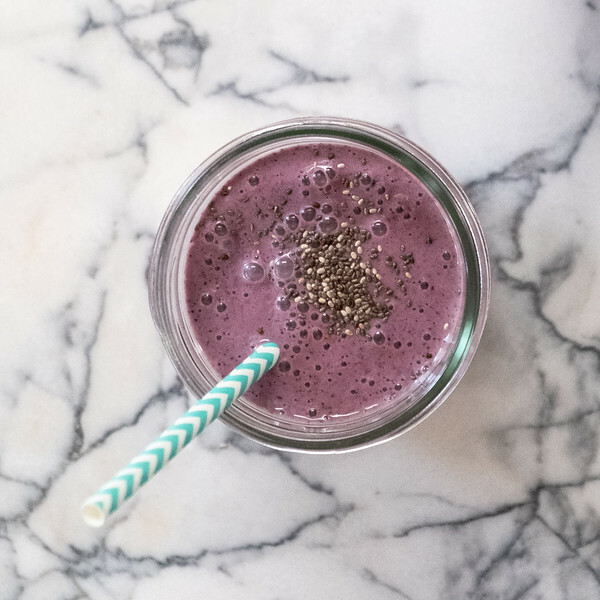 This blueberry almond smoothie is on regular rotation at our house. We love how rich and creamy it is and that it has no refined sugar and it’s dairy free! I found this recipe in an old Donna Hay magazine that is no longer being produced. Favorite ways to sweeten smoothies without refined sugar – we bought a big bag of organic dates from Costco and have been using them a lot in our smoothies. Dates are vegan, paleo and Whole30 compliant. We also like to use maple syrup – which is paleo and vegan, but not Whole30. Honey is also a good choice, it is paleo but not Whole 30 or vegan. If you want even more smoothies, be sure and follow my Smoothies Pinterest Board! 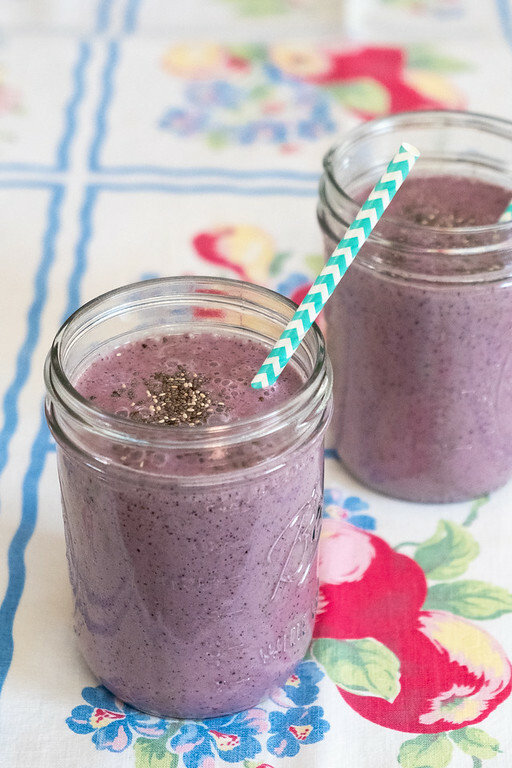 This blueberry almond smoothie is creamy and bursting with blueberries! No refined sugar and almond milk make it vegan, Whole30 and paleo! Place almonds and dates in a small bowl and cover with boiling water. Let sit for 5 minutes. In a blender add the almond milk, drained almonds and dates, blueberries and ice cubes. Fresh or frozen blueberries will work. If using frozen, omit the ice cubes. If using sweetened almond milk, omit the dates if you don't want it overly sweet. In place of dates, you can use a tablespoon of maple syrup or honey. It is almost impossible to make a bad smoothie! This one looks like a great one. Love that you sweetened with dates. I have to make it for my morning smoothie. Yummy! Blueberries are my absolute favorite and all of the almond stuff is great, as I already have it around. This smoothie is spot on and tastes wonderful.